The Moro was a Battle Honour granted to Canadian units participating in actions fought in the area of the Moro River and the city of Ortona in December 1943 as part of the fighting of the Italian Campaign during the Second World War. With the balance of forces in the Germans' favour, the theatre commander, General Dwight D. Eisenhower, and the commander of the Allied 15th Army Group, General Harold Alexander, decided on a co-ordinated offensive on Rome as the best way to mitigate the threat posed to the two Allied armies in Italy (U.S. 5th and British 8th). It was felt that the initiative could be retained until spring, and that at that time, the more enemy divisions were used in counter-offensives against the Allies, the better it would be for the Allied invasion of France, drawing German resources away from that theatre. Despite protests by his own chief of staff, citing the poor road network and the favourable defensive terrain, including several river lines, Montgomery pushed ahead, convinced that the British 78th Infantry Division, 8th Indian Division, and 2nd New Zealand Division would be able to reach Pescara in one mass attack, supported by 400 tanks. All that was needed was good weather and the air power that went with it. After the 1st Canadian Division moved to the Adriatic sector following its actions on the Sangro River, they faced a series of gullies and ridges across their new axis of advance, breaking up the coastal plateau east of the Maiella. Three main rivers also barred easy movement, in turn being the Feltrino, the Moro and the Arielli, entering the sea some 7, 9, and 14 miles from the mouth of the Sangro respectively. The area was well-farmed and olive-groves and vineyards laced the terrain, with scattered villages and hamlets connected only by narrow and poorly surfaced roads, Highway No. 16 running in general on top of the plateau. A newer stretch of highway ran from San Vito, overlooking the mouth of the Feltrino, following the coast north over the Moro River. Major-General Chris Vokes, on assuming command of the coastal sector, ordered the Irish Brigade and 4th British Armoured Brigade to keep moving forward after securing San Vito, and by night of 4 December were on the ridge between the Feltrino and Moro Rivers. To their left, troops of the 8th Indian Division captured Lanciano on 3 December and had reached Frisa, three miles inland from Sant' Apollinare. These operations were being supported by tanks of the 14th Canadian Armoured Regiment (Calgary Regiment), under control of the division from 1 December. 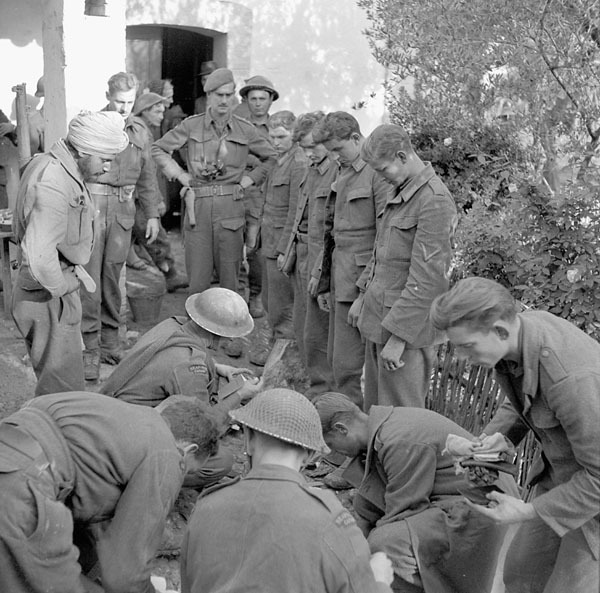 On the night of 2-3 December the Calgary Tanks carried Sikhs of the 21st Indian Brigade to the outskirts of Lanciano as part of a "noisy demonstration" towards the coast, in which they were joined by the 5th Battalion, Royal West Kents (also of 21 Indian Brigade), all of which was designed to assist 78th Infantry Division in the capture of San Vito. On 4 December, the Calgary Tanks formed part of a flying column which then occupied Frisa. Meanwhile, the 2nd Canadian Brigade was ordered to occupy positions between Sant' Apollinare and the Indians, facing the Moro, while 1st Brigade concentrated on the San Vito plateau. On 5 December, the 3rd Canadian Brigade, south of the Sangro, was ordered to cross the river. Fair weather, to that point permitting air cover to operate in favour of the Allies, also began to melt the snow in the mountains, deepening and widening rivers and adding to the logistical burdens. On the night of 4 December the Sangro River rose six feet, and every bridge serving the 5th Corps (to which the 1st Canadian Division was subordinate) was either washed away or submerged. Engineers struggled to complete an all-weather bridge as traffic came to a standstill; luckily a supply dump had been established near Fossacesia and DUKWs (amphibious trucks) were able to ferry supplies around the river's mouth. The Royal Canadian Army Service Corps was able to effectively re-establish a supply line with these vehicles; on 7 December, for example, orders for supplies included 50,000 rounds of artillery ammunition, 10,000 gallons of petrol and 40,000 rations. The 3rd Brigade, however, was unable to fulfill its orders to rejoin the division for two days, and even as it moved again on 6 December, had to leave 200 heavy vehicles south of the Sangro. Allied intelligence staffs correctly assessed the enemy's intention to stop further Allied advances on the Moro, after having been evicted from the Bernhard Line. The 76th Panzer Corps determined on 1 December that it would hold a line as far as Melone (two miles east of Guardiagrele) and develop also a new line Melone-Ortona, and stop any attacks in the area of their outposts by "obstinate delaying actions." The German 65th Division had been smashed during the Bernhard Line fighting, its remnants ordered north to join the 14th Army, and the 90th Panzergrenadier Division moved south hastily from the Venice area, taking over the coastal sector on 3 December. To its right, the 26th Panzer Division had relieved the 16th Panzer Division, the latter urgently needed on the Eastern Front. a narrower road crossing south of Villa Rogatti, a small village atop the left bank, two miles upstream from San Leonardo, and referred to by the Allied troops as Villa Roatti due to typographical errors on their maps. (The Germans called the place Villa Ruatti). Behind San Leonardo and Villa Rogatti lay a long slope, with hamlets (La Torre, Villa Jubatti, Villa Caldari) separated by deep gullies cutting back severely from the Moro Valley. The gullies were viewed as possible routes up onto the top of the plateau. The Patricias scouted below Villa Rogatti and found a ford that could also bear the weight of tanks, though the far bank was steep. Two hundred yards beyond the west bank, enemy halftracks and motorcycles could be heard. Vokes, on hearing reports from the 38th Brigade that the river was wider and deeper farther downstream, resolved to continue the advance up Highway No. 16 and establish one of the Canadian brigades at the junction with the Guardiagrele-Ortona lateral road, exploit to Tollo across the Arielli, and then move to the coast and Ortona. The engineers were tasked with readying a crossing below San Leonardo; with the central route selected for the main crossing, two other sites were also to be established by the infantry, near the coast and at Villa Rogatti, either to divert enemy attention away, or to be used in earnest if need be. Patrols on the 5th continually reconnoitred the line of the river while tank crews personally inspected the crossings. Desultory bombing from enemy aircraft did no real damage, and Allied air superiority ensured that even long lines of stopped vehicles at the downed Sangro bridges did not invite enemy air attack. The Patricias were able to ascertain little from their patrols, other than the village was held by a central garrison with a defensive perimeter. Only later were the defenders identified as soldiers of the 200th Panzergrenadier Regiment (a component of the 90th Panzergrenadier Division). What was known, however, was that the village was protected from the east by the sharp banks of the Moro escarpment, and two steep gullies on north and south further made an approach difficult. The village itself was divided by a ravine running into it from the east. The only level ground lay southwest of Villa Rogatti, carrying a track from Villa Caldari. The Patricias, under Lieutenant-Colonel Cameron Ware, planned to cross the Moro with "B" Company leading. Tanks of the 44th Royal Tank Regiment were to descend a winding road one mile south of the village, ford the stream, then move down the valley in the lee of the far bank, until it could ascend a gully 500 yards north of the village, the ground there being more gradual. The company forded the river at midnight, and the leading platoon first drew fire on reading a track that linked the two parts of the village. The Seaforth Highlanders of Canada simultaneously made an advance on the larger town of San Leonardo. Nestled as well against the high river bank of the Moro to the east, San Leonardo was protected to the south by a long gully, which cut for 2,000 yards down the plateau to the village of La Torre. Patrols had garnered even less information about the defences there than at Villa Rogatti, and German shelling had hindered observation and reconnaissance. "B" Company took up positions in the gully at midnight as part of the first of two phases of the planned operation. Their mission was to block enemy reinforcements from entering the battle from La Torre. Simultaneously, "C" Company was to move up the road towards the town of San Leonardo itself, while "A" Company moved out on a right flanking half an hour later, using a covered approach. Action against La Torre would be made if possible, and tank support was to follow after daybreak. This well-tried doctrine depended upon a high volume of fire designed to neutralize the enemy while the infantry and tanks closed with the enemy. Problems began when the enemy had sufficient time to develop an elaborate defensive position on favourable terrain, such as the heights above the Moro River.The men of 90th Panzer Grenadier Div., who had arrived in the area just before the Canadian relief of 78th Div., had been told that the �watchword for one and all is into the ground.� The Germans placed the majority of their automatic weapons on the forward slope, carefully camouflaged with alternate positions. Riflemen were posted nearby to provide flank protection. The main force was held well back in deep dugouts available to serve as counter-attack forces or reinforcements for the most threatened sectors. Light machine-guns�MG-42s�were set up to cover every approach route with interlocking bands of fire and direct fire down tracks or trails. The third action of the night of 5-6 December was an attack by The Hastings and Prince Edward Regiment. This diversionary attack, meant to draw German attention away from the PPCLI and Seaforth crossings, was made into the teeth of a fully alerted enemy. Darkness had already fallen when the Hastings relieved The Royal Irish Fusiliers on the seaward flank of the division. "Apart from some hurried conversations with the Irish there was no time for a briefing or to carry out reconnaissance. "13 Patrols reported the best spot to make their crossing of the Moro at a place 200 yards inland, with the plan being that if the leading company managed to gain a bridgehead, the rest of the battalion would follow on and consolidate. Another counterattack, from the expected direction, materialized at 14:30hrs, with a company of the 26th Panzer Regiment, including nine PzKpfw IV tanks, supporting the infantry. "B" Company of the Patricias held the main, southern, portion of the village, and three German tanks were knocked out in quick succession, one by a PPCLI anti-tank gun firing from the far side of the Moro. The attackers split up and attempted to attack both flanks of "B" Company. 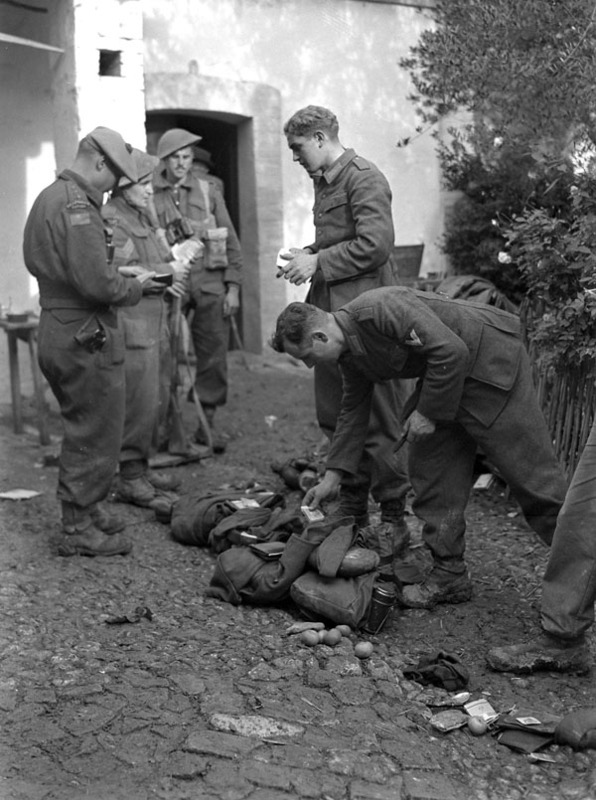 The battle cost the combined force 70 casualties and two Shermans, but the British and Canadians accounted for 100 dead enemy soldiers and five PzKpfw IV tanks, as well as 40 enemy prisoners.17 The Germans left a sizeable inventory of equipment on the field, and the PPCLI losses of 8 dead, 52 wounded and 8 captured was their highest total for a single day in the campaign thus far. The withdrawal of the Seaforths highlighted what "B" Company had accomplished in the initial attack. Out of contact on La Torre spur, it had come under heavy mortar and machine gun fire at daybreak on the 6th, pressed on towards the village, overran no fewer than sixteen German machine guns, and taken 40 prisoners. By late afternoon, the company commander realized the precariousness of their position, isolated deep in German territory, and upon observing La Torre being reinforced by 200 Grenadiers, skillfully withdrew his men. Infantrymen of The Seaforth Highlanders of Canada search German prisoners near the Moro River on 8 December 1943. Brig. Howard Graham and Kennedy met to consider their options. Kennedy reported that the Moro was no obstacle to infantry but �it is soft bottomed and in conjunction with the muddy condition of the whole valley it is a complete tank obstacle.� He was confident that a well organized battalion attack with observed artillery and mortar fire could win a bridgehead. The divisional commander, Major-General Chris Vokes, was still focused on the 2nd Bde. crossing, but he told Graham to go ahead. From his observation knoll it appeared to him that Dog company had become too deeply involved on the left flank, and was in danger of being overwhelmed. The failure of the tanks to get across made it seem certain that any local success which might be won by the infantry would be transitory and liable to be turned into costly defeat. Charlie company, on the valley floor, was clearly unable to get forward to assist Dog, and the weight of the enemy defensive fire seemed to be increasing, rather than decreasing. The Hastings were in fact the only unit across the Moro River, and what was supposed to have been a diversion was becoming the main effort of the entire division. Before the Canadians crossed the Moro, ULTRA intelligence had suggested the enemy's 65th Infantry Division had been heavily punished, and the boundary of that formation with the 26th Panzer Division was located. The 2nd New Zealand Division was sent in to exploit what was considered a weak point in the German defences, take Orsogna and from there move north to Chieti, the capital of the province, even before the Canadians could get across the Moro. The New Zealand formation was a unique hybrid of two infantry and one armoured brigades, and while Orsogna fell on 7 December, they were forced to withdraw the next day. When the German high command learned of the New Zealand attack, Field Marshal Kesselring ordered his corps commander �to hold at all costs� so that the troops east of Orsogna would not be enveloped. He insisted that �the ground there is so favourable that it can be held by relatively small forces.� Kesselring was right; the natural defences were too strong to be overcome by any division unless a means of outflanking the ridge could be found. It was up to the Canadians and the 8th Indian Div. to accomplish this.